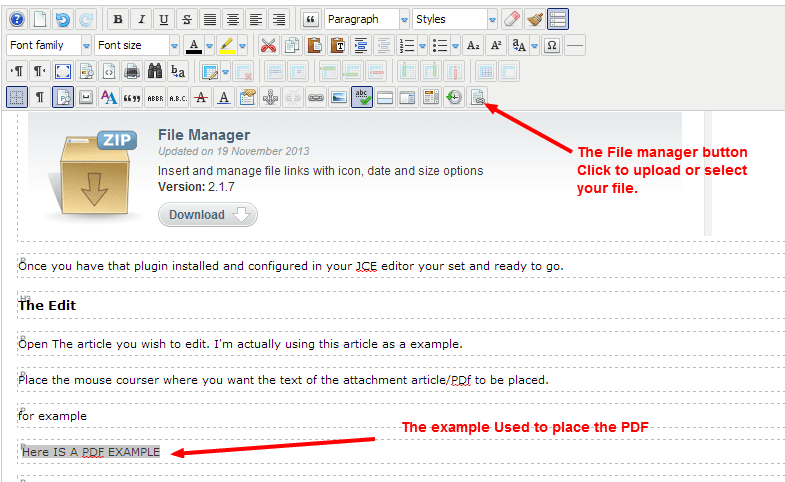 Should you wish to add a PDF to a webpage/article in Joomla its not a good idea to use the standard media manger tool. As Developers when we add a PDF to a webpage using Joomla, we use the JCE editor (Content Editor For Joomla) and its file manger tool . JCE is a free editor and most features are included. The file manager plugin is unfortunately one of the plugins you require a subscription to download. Do not fret though if your using Joomla this editor is excellent and does do most everything and is contentiously updated and improved. its a very active project. It included Iframe support, Media support and much more. If you have not done so download the file manager plug from the JCE site and install it. It's found under plugins once logged in the JCE site. Once you have that plugin installed and configured in your JCE editor your set and ready to go. Open The article you wish to edit. I'm actually using this article as a example. Place the mouse courser where you want the text of the attachment article/PDf to be placed. then click the file upload button as indicated above. Often the bottom is found in the bottom row - right. JCE does allow you to move it where you prefer. JCE will now open a window to upload the file/pdf so you can place it where you wish. I always place PDF's in a folder named "pdf" just for simplicity. The JCE editor even provides the ability to create a folder on the fly. See below for example of teh the pop up when File manager button is clicked. That's it you now have a PDF inserted in your article. Just like above.